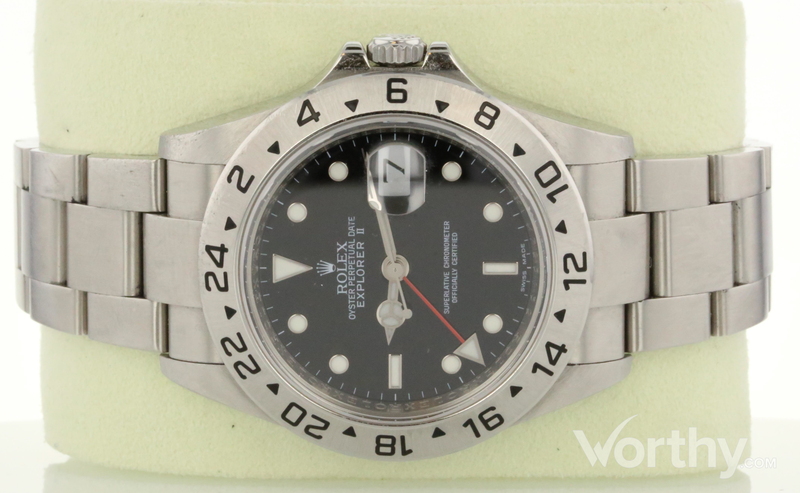 This Rolex 16570 Ref. No. : m723132 was auctioned at Worthy. The man's watch is 40 mm in diameter with stainless steel case, stainless steel band. It features day complication and automatic movement. It came to us with papers and the original box. It is in very good condition and attracted 278 buyers. Rolex Explorer II with black face watch. Watch has original inner and outer boxes, tags, and paperwork. Watch is running but has not been tested. Bracelet and buckle shows scratches, scratches on bezel. Hands are moving but watch has not been tested.